The penthouse has a double bedroom, full bathroom with shower and a living room with a sofa bed and kitchenette. Finally, it has a magnificent terrace (60 sqm) with dining table and sunbeds, suitable for sunbathing, intimate dinner and spend unforgettable moments, suspended between sea and sky. (Very suitable for couples on honeymoon and artists seeking inspiration). The house is fully equipped with air conditioning, wireless Internet access both inside and outside and is equipped with everything you need for a pleasant and relaxing holiday . Cot on request at no extra cost. 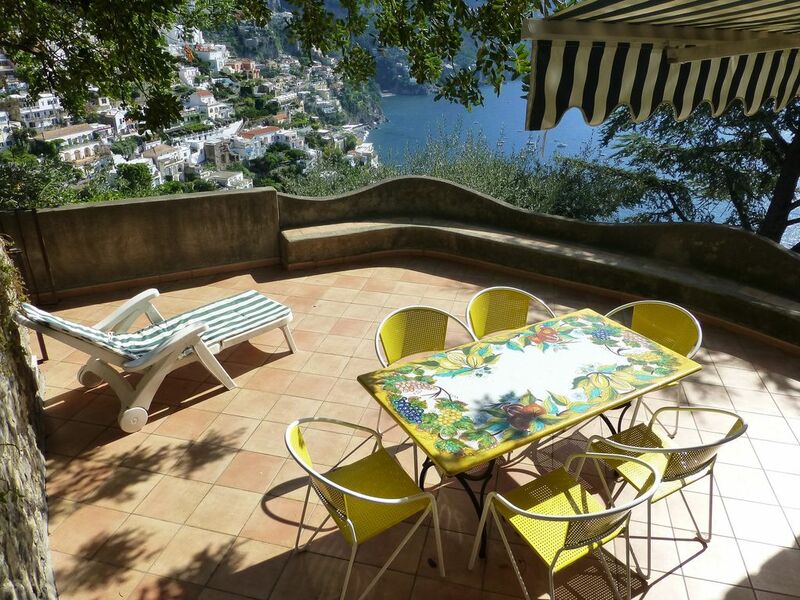 This Positano villa rental (100m2) is situated on top of a rocks in the Fornillo area in Positano and proudly overlooks the southern part of the Amalfi coast. this privileged spot, on a rocky cliff in Positano, between the sea, and the country. Make this home a special place, and this is exactly the feeling one gets entering Villa Boscariello, the breathtaking view of Positano and its bay, the peacefull location, the house is surrounded by plants and trees such as bougainvillea, carob, olive, orange and lemons. close to the town center and at the same time reserved and quiet, overlooking the sea that you can hear the sound. There are many steps to reach this Positano villa but the reward is a unique spot with stunning views. The villa offers comforts like air conditioning, several terraces and complete privacy. The villa has a garden (25m2) where you can escape from the sunlight and relax in the hammock. One terrace has a large dinner table and is about 35m2. Another terrace of about 25m2 in front of the Villa is perfectly suited for sunbathing, and the last smaller is near the second bedroom. I was born in Positano in 1960, and I live in Positano with my family, I lived in this house for 10 years. To spend an holiday in a peaceful location, very romantic, with a lot of space, and a spectacular view. Outside: Villa Boscariello is a comfortable house with large terraces. It is an independent portion of a villa in a shady garden with lemon, orange, olive. Overlooking Positano’s Beach and the Amalfi Coast. Every house has a separate entrance from the garden, which gives all due confidentiality and privacy. The apartment "villa Boscariello" has a garden (25m2) where you can escape from the sunlight and relax in the hammock. One terrace has a large dinner table and is about 35m2. Another terrace of about 25m2 in front of the Positnao Villa is perfectly suited for sunbathing. On every side you can admire a fantastic views The apartment "Penthouse Bosca" a magnificent terrace in front of the house with the most beautiful view of the entire villa. Giovanni is a great host. Helpful with information and parking. He met us both for hello and goodbye. Via Boscariello is perfect for a couple. The view is simply amazing. Stay here to feel like you live here. We had a blast. Giovanni met us down stairs and took us up to our apartment. Place was super clean, had a nice patio so we could eat breakfast every morning and drink wine at night. It had the most incredible view! Very quiet too and close to restaurants. Thank you Giovanni for having us. Hopefully we will come back soon! I don't have the right words to express how I felt when I got to that balcony. The photos do not show the wonder of that place. It is just AMAZING, like a dream. The apartment is comfortable, very clean, super comfy bed, a nice kitchen to prepare something simple, and did I talk about the balcony? Yes, it is true that there are 168 steps to reach the house, but it is really worth it. I am 53 years old, and I did it for 4 days, sometimes, more than once a day. You simply stop and enjoy the view, catch your breath and keep going. Giovanni and Maria are very welcoming, and share a bottle of their own wine whit their guests. One of my best vacation ever. Una de mis mejores vacaciones. Thank you Giovanni y Maria. Giovanni is a very lovely host, he gave us guide about bus station, where to go and he even gave us a bottle of wine he made! The b&b has fantastic view accross Positano, we had breakfast at the terrace everyday! Beautiful view and close to pretty much everything we needed to do! Our advice is to bring some good shoes for the stairs and do one or teo big grocery shops with a backpack and you’ll be good to go! No complaints with the house it was a perfect bit of paradise to chill out and rest. Town center 5 mins walk. Booking Notes: Breakage deposit - €50 in cash upon arrival These items are included in the rental rate: Water, Gas, Internet, linen, towels, 70Kw Electricity included (for a week)/ Extra use 0,30 Euro/KW Changeover Day: Please contact owner.